Sometimes, going back to the well isn't necessarily a bad idea. 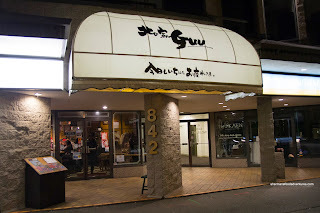 Although we had intentions of trying something new, Grace, Sean and I ended up at Guu Original on Thurlow (with a small push from moi...). 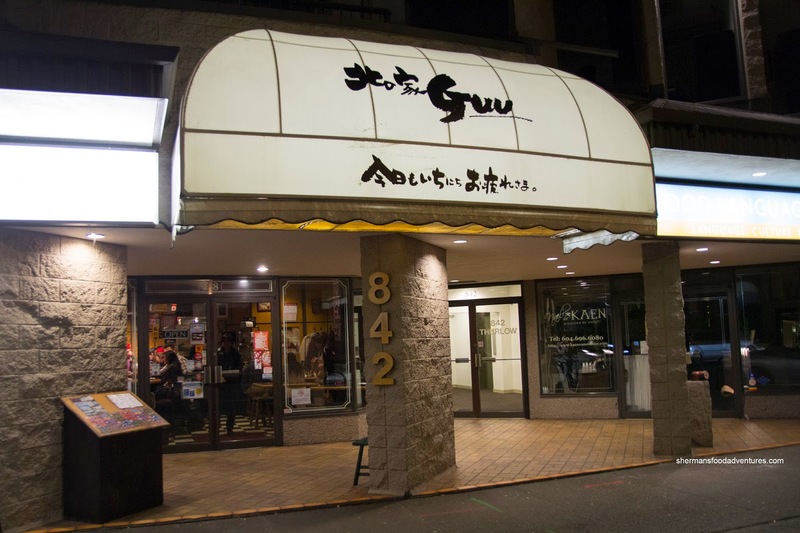 Quite possibly the first real Izakaya in Vancouver (at the time), Guu Original pioneered the small plates with booze complete with a whole bunch of yelling from the staff. And ya, we were greeted by the expected yelling and seated at one of the small tables complete with the usual uncomfortable chairs. 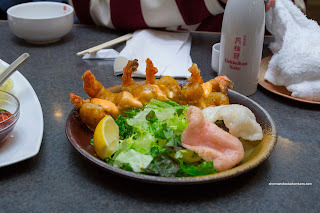 And off course I had to order the Ebi Mayo where we found it only marginally crispy on the outside. 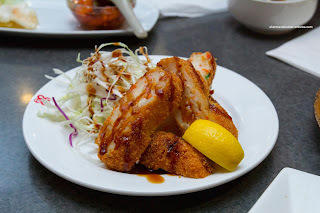 Instead, it was more "fluffy" than anything else with an airy batter from the exterior to the ebi. The ebi itself was meaty and had a slight snap. There was definitely enough chili mayo (possibly too much) on the bottom which coated each piece. It was not spicy-at-all despite the colour. 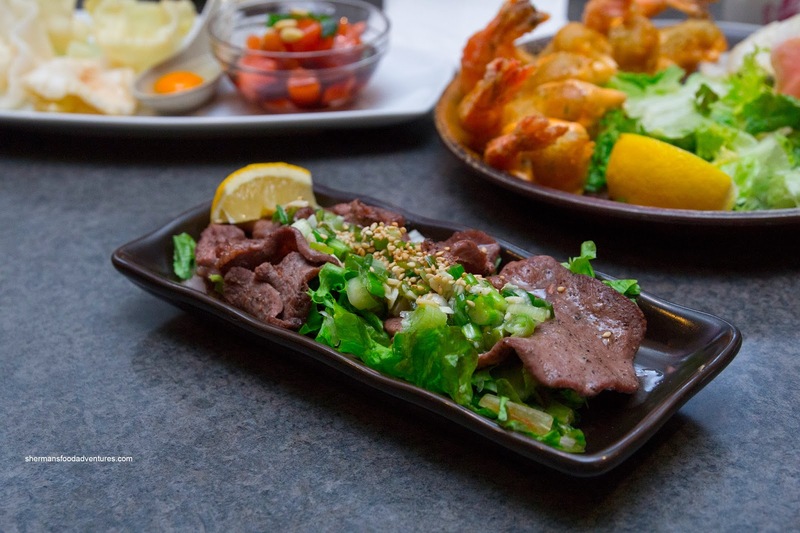 Grace really wanted the Gyu-Tan (Beef Tongue) and we gladly shared it with her. She seemed joyful in that respect... Anyways, tt was chewy, as with any non-stewed ox tongue would be. However, it was okay enough to eat. Flavour-wise, it was pretty au natural with not much in any seasoning. Elegantly plated (for an Izakaya), the Maguro Steak was a large portion and well seared. On the inside, it was still rare, which meant it wasn't hard to eat. 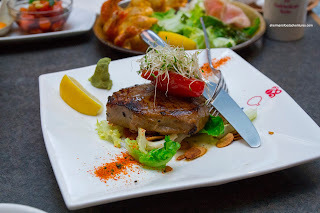 It was buttery and tasty due to the caramelization on the outside which was aided by garlic chips, soy and spicy seasoning salt. 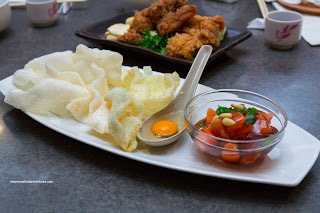 It was more filling that it looked (or maybe it did look filling...) We weren't overly enthused with the Deep Fried Ling Cod "Surimi" Croquette as it was a bit plain. 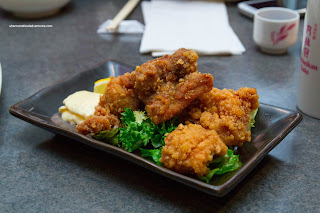 Although it was fried up crispy on the outside and sweet on the inside, there was no defining flavour or texture that would make it memorable. On the other hand, a squeeze of lemon did bring it somewhat alive. 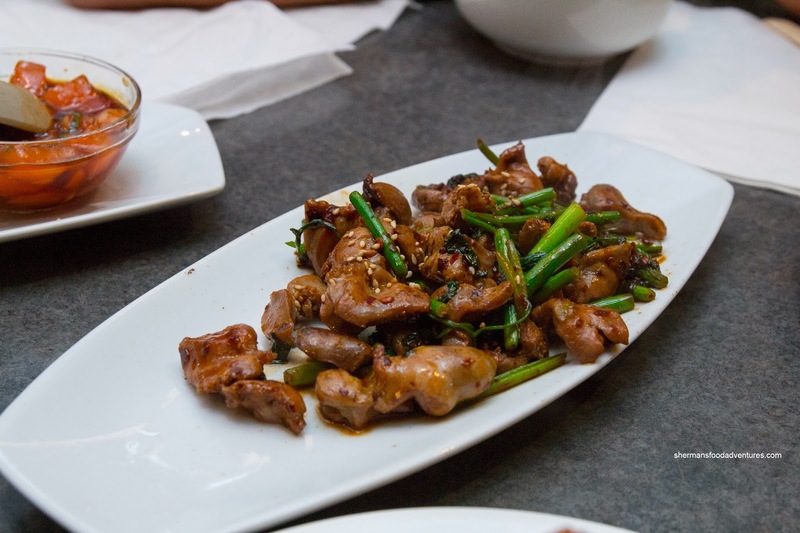 Lastly, we had the Pan-Fried Chicken Hearts and Gizzards with garlic stems. This was flavourful with some spice. The gizzards were crunchy and chewy while the hearts were a touch overdone. I liked the crunchiness and herb-flavour of the garlic stems which provided a brightness to an otherwise heavy dish. Ultimately, despite the minor shortcomings of some dishes, we enjoyed coming back to the original Guu where it continues to be a dependable option for an Izakaya in Downtown.